Our brains must constantly process a wide variety of stimuli from our environment to generate behavioral responses. In large part, this is regulated by one of the brain’s smallest nuclei, the Locus Coeruleus (LC). Through release of norepinephrine (NE), the LC modulates numerous behaviors, including regulation of sleep/wake states, increasing attention and memory, and regulation of stress and pain response. Our lab is interested in identifying and characterizing novel mechanisms that regulate the function of the LC-NE circuit in vivo, towards understanding how LC-related brain circuits help to generate distinct behaviors depending on the situation. To address these questions, we use a wide array of approaches, including viral tracing, next-generation sequencing, in vivo imaging, and optogenetics. St. Jude is home to a large number of renowned research labs, performing cutting edge work in a variety of scientific disciplines, such as oncology, immunology, structural biology, and neuroscience. The research culture at St. Jude is diverse, collaborative, and innovative, with a strong emphasis on providing outstanding institutional support so that researchers can focus on their science. Our lab is part of the Developmental Neurobiology department, which conducts basic science research on a wide range of topics such as early cell fate decisions, neuronal migration, control of neuronal cell death and regeneration, synaptic physiology, and neural circuit function. We are also part of the newly formed Division of Neural Circuits and Behavior, which provides specialized departmental resources for our studies. Schwarz lab at the departmental holiday party, Dec 2018. We're looking for bright, collaborative, and rigorous scientists to join our group. To apply for a position, please send the information requested below to: lindsay.schwarz@stjude.org. Applicants must have completed or be nearing completion of a Ph.D. in neuroscience, biology, or related fields. We're especially interested in candidates with expertise in optogenetics, animal behavior, in vivo imaging, or genome sequencing. To apply, please send a CV, a description of your current and future research interests, and contact info (phone# and email) for 3 references. St. Jude offers generous training and support for postdoctoral fellows. To learn more, click here. Apply to our new graduate school program! We're happy to discuss research opportunities with incoming or current graduate students of St. Jude or University of Tennessee Health Science Center. Yackle, K, Schwarz LA, Kam K, Sorokin JM, Huguenard JR, Feldman JL, Luo L, Krasnow MA. 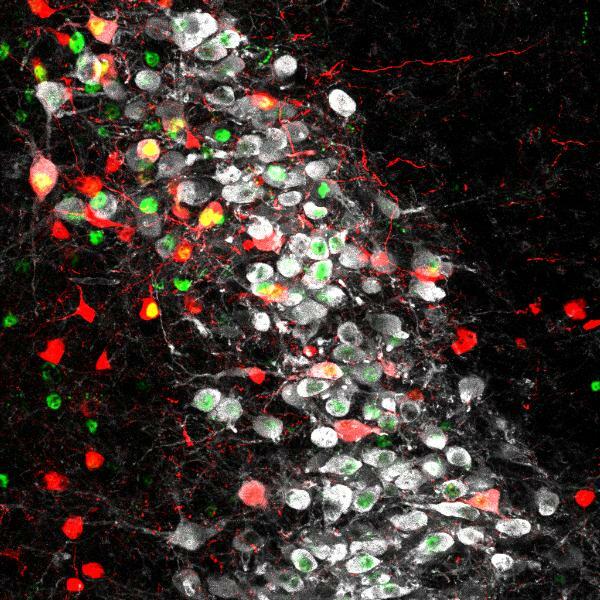 (2017) Breathing control center neurons that promote arousal in mice. Science. 355: 1411-15. Huang WH*, Guenthner CJ*, Xu J*, Nguyen N, Schwarz LA, Wilkinson AW, Gozani O, Chang HY, Shamloo M, Luo L. (2016) Molecular and neural functions of Rai1, the causal gene for Smith-Magenis Syndrome. Neuron. 92(2): 392-406. Gong H, Xu D, Yuan J, Li X, Guo C, Peng J, Li Y, Schwarz LA, Li A, Hu B, Xiong B, Sun Q, Zhang Y, Liu J, Zhong Q, Xu T, Zeng S, Luo Q. (2016) High-throughput dual-color precision imaging for brain-wide mapping of the connectome using cytoarchitectonic landmarks at the cellular level. Nat. Commun. 7(12142). Schwarz LA, Luo L. (2015) Organization of the locus coeruleus norepinephrine system. Current Biology. 25(21): 1051-56. Schwarz LA*, Miyamichi KM*, Gao XJ, Beier KT, Weissbourd B, DeLoach KE, Ren J, Ibanes S, Malenka RC, Kramer EJ, Luo L. (2015) Viral-genetic tracing of the input-output organization of a central norepinephrine circuit. Nature. 524(7563): 88-92. Beier KT, Steinberg EE, DeLoach KE, Xie S, Miyamichi KM, Schwarz LA, Gao XJ, Kremer EJ, Malenka RC, Luo L. (2015) Circuit architecture of VTA dopamine neurons revealed by systematic input-output mapping. Cell. 162(3): 622-34. Scudder SL, Goo MS, Cartier AE, Molteni A, Schwarz, LA, Wright R, Patrick, GN (2014) Synaptic strength is bidirectionally controlled by opposing activity-dependent regulation of Nedd4-1 and USP8. J. Neurosci. 34(50): 16637-49. Schwarz LA, Patrick, GN (2011) Role of ubiquitination in regulating the endocytosis and intercellular trafficking of surface proteins in the nervous system. Mol. Cell. Neurosci. 49(3): 387-93. Schwarz LA, Hall BJ, Patrick GN (2010) Activity-dependent ubiquitination of GluA1 mediates a distinct AMPAR endocytosis and sorting pathway. J. Neurosci. 30(49):16718-29. Djakovic SN, Schwarz LA, Barylko B, DeMartino GN, Patrick GN (2009) Regulation of the proteasome by neuronal activity and Calcium/Calmodulin-Dependent Protein Kinase II. J Biol Chem. 284(39):26655-65.